Dr Simon Longstaff, Bri Williams, Dr Bob Murray and Dr Don Munro consider the tricky business of putting ethics into practice at a recent event hosted by The Ethics Alliance in three states. If ethics is so obvious, why is it so hard? Most not-for-profit leaders aim to set - and expect the people in their organisations to practise - high standards of ethical behaviour that will protect their organisations' reputations and maintain the trust of members, clients and stakeholders. But experts in the field of human behaviour and management say humans are irrational and tribal, and getting them to behave in a particular way isn't always easy. The Ethics Alliance - a group of like-minded businesses who've pledged to do better when it comes to ethics - recently hosted an event aimed at exploring these issues, and Community Directors Intelligence went along to learn more. 'Embedding Values and Principles' brought together a psychologist, a behavioural scientist and a top public servant in a session hosted by The Ethics Centre's Dr Simon Longstaff. The Ethic Centre's executive director, Simon Longstaff, told Community Directors Intelligence that leadership and ethics are in lockstep. He has also written a more detailed examination of ethics and leadership in this edition, but summarised these thoughts at the event. "In the past, people have tended to think of leadership as something separate, into which one injects a little bit of ethics from time to time. "But in fact, leadership itself is an ethical practice. It's about moral courage; for example, having the courage to question the conventions of the place where you might be working. "It's about having a clear sense of purpose and values and principles. And you cannot lead, I'd say, you cannot understand leadership … unless you understand its ethical dimension." He says one of a leader's top responsibilities is to be able to transmit ethical practice clearly and consistently. "Be very clear about your purpose. People need to understand that, along with your values and principles. Unless you tell them, there's no basis against which they can calibrate their own conduct, so you need to be very explicit about it." And he says good leaders must be "relentless in ensuring the consistency of what you actually do, to see that aligns with what you say". Yet he acknowledges ethical decisions can face strong resistance, and that real leaders must decide how and when it's right to take action. "Most of the bad things that happen in the world are done by good people doing bad things. So firstly, you've got to understand that in many, many cases, when you ask people, 'Well, why did you do it? ', they'll say, 'Well, I didn't see it at the time'. Why did you not see it? 'Because everybody was doing it, because that's just the way we were doing things around here'." When people realise they're making a real choice between right and wrong, it becomes a true test of leadership. "There are some cases where [people] actually see what they're doing as wrong, and they do it anyway, because they're under so much pressure. That's where the issue of moral courage comes to the fore," Dr Longstaff says. "I'm not saying that people have to throw themselves onto the funeral pyre of integrity and disappear with a few brief, beautiful sparks. "But you do know that there will be times when you have to be willing to take risks, hopefully in a nuanced and intelligent way, in order to try and bring about change." 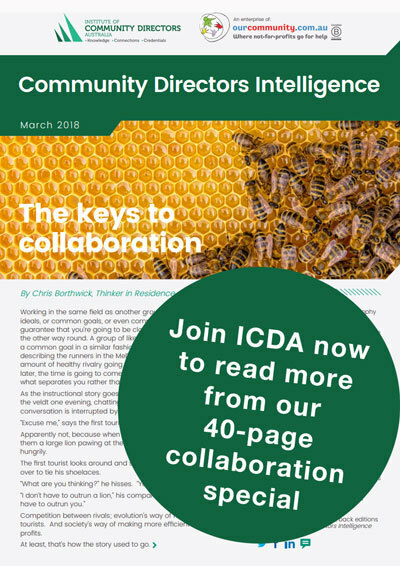 If you're not an ICDA member, join here for as little as $65-a-year to get our monthly email Community Directors Update and our quarterly newsletter Community Directors Intelligence. You will also have full access to our online library, our help forum, a 10% discount to the Board Builder conference, discounts and invites to other events, and the chance to connect with a network of like-minded community directors.